Complementing Husqvarna’s wheeled portfolio for 2018 is a new L421P 21-in. walk mower that delivers first class results and performance on any terrain, whether collecting or mulching. Husqvarna first presented this addition to its commercial lineup at the 2017 GIE+EXPO. A durable and robust commercial-grade mower, the L421P is designed with a lightweight body to maximize maneuverability and efficiency. With a 21-in. 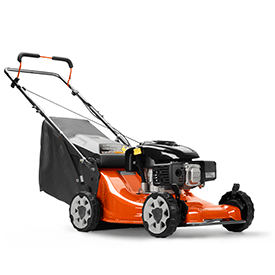 reinforced PremierCut deck that delivers superior cutting performance and extra protection from the sturdy collision guard, this mower can tackle even the toughest of lawns. 7.75 ft-lb of torque and 4 hp, a high-capacity grass bagger and 8-in. heavy-duty wheels with ball bearings make this a powerful walk mower perfect for areas bigger equipment can’t get to. For increased operational efficiency, both sides of the deck can trim close to barriers, and the reinforced 4-point height adjustment makes it easy to switch from one height to another. The L421P also features reinforced foldable handles that make it easy to stow in the landscaping trailer.